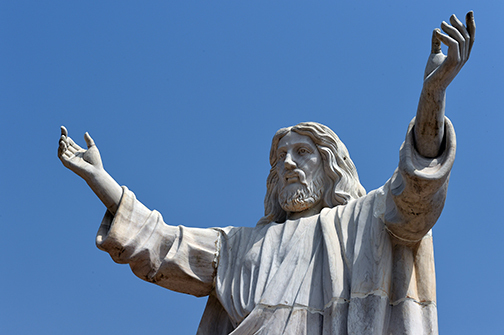 ABAJAH, Nigeria (AFP) – Nigeria on Friday unveiled a nine-metre tall statue of Jesus Christ carved from white marble, thought to be the biggest of its kind in Africa. Earlier in the week, Onuoha told AFP it would be “the biggest statue of Jesus on the continent”. Nigeria, Africa’s most populous country with 170 million people, is split between a more prosperous Christian south and a poor Muslim north – an occasional source of tension. Whilst it’s good to see Africa still proclaiming Jesus, the son of the living God it’s disappointing that the image is in the reflection of a Caucasian. The Bible states that when the Lord returns his skin will be like burnt brass and his hair like wool. These features are not those of Caucasian but people of African lineage. It’s time that the truth be told because half the story has never been told.No wonder the Caucasian thinks he is superior. Come on my people the truth cannot be denied anymore.